This post comes courtesy of Christina’s friend, Jenn. Come read about her journey through a ten-day challenge to eat only real food. researched and tried many eating plans. From Atkins to vegetarianism, from dairy-free to fat-free, I have experimented with them all. My conclusion is that it doesn’t matter whether you are a carnivore or herbivore; food is healthiest when it is real. That is, when it is unprocessed and as close to the way it is found in nature as possible. Real food is made from scratch with whole ingredients. It does not come in a box or a bag. It does not contain any ingredients that you can’t pronounce or identify without the help of Wikipedia. This was my challenge. For 10 days I committed to every morsel that passed my lips being real food. In my quest to find information on how to begin, I discovered the website 100daysofrealfood.com and signed up for the 10 day pledge. The gist of the plan is to avoid anything processed. This basically means no sugar, no fast food, and virtually nothing that comes from a package. You can, however, eat real butter! And cheese! Yes, that’s right, people. Throw out your tasteless butter substitutes and your fat-free cheese. They’re not real food and they’re not good for you. This was, of course, the best news I had heard in years. As expected, fruits, veggies, and whole grains are also green-light foods. 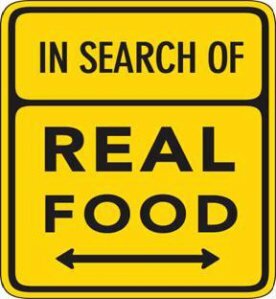 You can find all of the rules outlined here: http://www.100daysofrealfood.com/real-food-defined-a-k-a-the-rules/. And so I begin. My first challenge reared its ugly head right there on Day One: coffee. this now. I found it fairly easy to stick to the pledge with a little planning and a lot of cooking. I sailed through the next few days, even preparing lunch for a friend, and keeping a junk-food lovin’ husband decently happy. Then came Day Five. I found myself trying to squeeze lunch into one of those busy mom days packed with grocery shopping, errands, Gymboree classes, and the need to get it all done before naptime. Well, eating out, I discovered, is virtually impossible. I wanted nothing more than to swing by my favorite bagel shop for my favorite bagel sandwich. Bagels are not, apparently, real food. So after some thought, I chose Chipotle. Brown rice, salsa, beans, veggies, and guacamole are all approved foods, so I figured a burrito bowl would work. Real food crisis averted. this girl! I ate until I was stuffed, savoring all of the deliciously forbidden foods. And I liked it. A lot. What I did not like was the stomach ache and hours of lethargy that followed. I was determined not to let this setback (and it was a big one) get the better of me, so I got back on the real food horse the next day and finished the challenge. Day Nine was actually the hardest, because I was riding high on the sugar from Day Eight and my body was not happy that I refused to give in to its craving for more. Day Ten was a breeze, as I was filled with the motivation to achieve my goal as well as the relief of it being almost over. By far, my favorite part of the challenge was cooking from scratch and trying new recipes. One of my favorites is baked oatmeal. 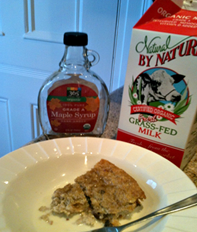 It is perfect warmed up with a little milk and maple syrup for breakfast or even dessert. And it’s completely toddler-friendly! You can find the recipe below. I also highly recommend the book Real Food: What to Eat and Why, by Nina Planck. It was this book that piqued my curiosity about real food and prompted me to start this journey. worry that the beef wasn’t grass-fed. And birthday cake will always be an acceptable food. 2. Add enough filtered water to completely submerge your oats and nuts. Add a dash of salt and yogurt. 3. Allow the oats and nuts to soak, covered, overnight in a warm place in your kitchen — about eight to twelve hours. 4. After the mixture has soaked overnight, dump the oats and nuts into a colander to drain and place the mixture back into the ceramic container or mixing bowl. 5. Preheat the oven to 375 degrees F and grease a 9×13-in baking pan with coconut oil or another wholesome fat of your choosing. 6. Meanwhile, beat together the eggs, milk, and maple syrup (if you’re using it), until well combined and frothy. 7. Pour the mixture over the soaked oats and nuts, stirring well to combine into a porridge-like mixture. 8. Gently fold dried fruit, cinnamon, and coconut oil into the porridge-like mixture. 9. Pour the mixture into the greased pan and smooth out with rubber spatula. 10. Bake for 40 to 45 minutes or until the oatmeal achieves a golden-brown color on top and a knife inserted into its center comes out clean. 11. Allow the oatmeal to cool for five to ten minutes before cutting into squares and serving. I hope you have enjoyed learning more about the real food diet. I was intrigued as soon as I heard Jenn was doing it, so I was so glad to hear that she was willing to share her experiences with it, especially her failures (because who has done a new diet without at least one of those?). And a ten-day challenge doesn’t sound so bad. Maybe our family can give it a try. We might be surprised at our results. Are you willing to take the ten-day challenge?